Chagrined but not defeated, I returned to Jones the Grocer today and knelt at the altar of cheesy fabulousness. I bought another sliver of Truffle Brie as a replacement for the “lost” one, and was rewarded with a sample of another cheese, Fosseway Fleece. Truffle Brie is a departure for me. I am usually a cheese purist – that is someone who likes their cheddar without sage and their goats cheese without chives. 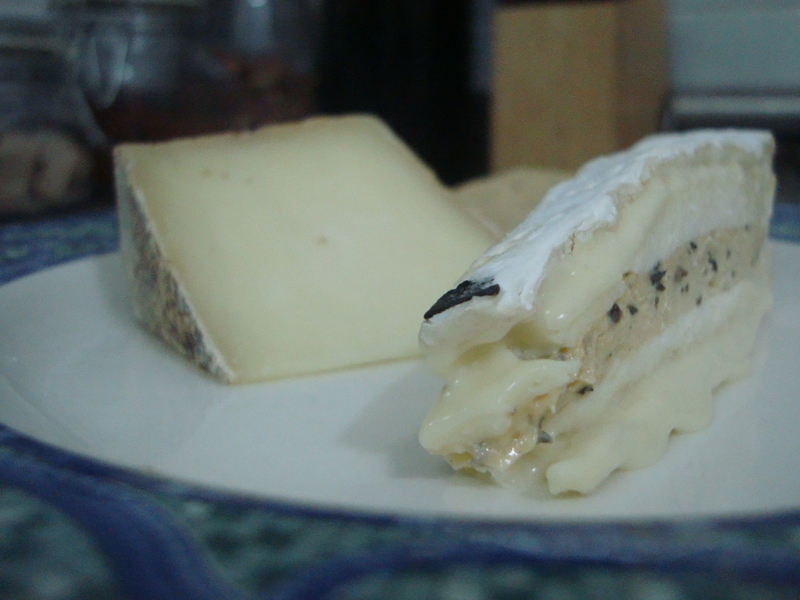 But the lure of the earthy taste of truffle and brie is just too much. It’s pretty hard to overwhelm the taste of a good brie and those one manages to balance both strong flavors. It’s made by slicing the wheel of brie horizontally and smearing a creamy, nutty truffle mixture then reassembling. Contrived? Yes. Pretentious? Oui? Delicious? Oh yeah! The other hunk I procured, Fosseway Fleece, is a sheep milk cheese. On my scale of fromage d’amour, it goes sheep, goat and then cow. There is something quite special about sheep cheese. This one is made in the style of a cheddar using ewe’s milk. Anyone unsure about heading down the sheep route, this would be a good starter cheese. It’s taste is clean and very smooth and it’s from the Somerset area of the UK, where some awesome cheeses originate. The famous Roman road of Fosse Way runs close to the village of Ditcheat, where the Somerset Cheese Company is based, hence the name. I really enjoyed this and it’s a great “gateway” cheese. Thanks to all for the suggestions. Portuguese cheese and the Stinking Bishop seem to be favorites and have been added to my list.